Item #: CC3449. Protecting the needs of small or medium business, the highest capacity and performance DAT drive with up to 320GB compressed data per cartridge and speeds of up to 86GB/hr (assuming 2:1 data compression). 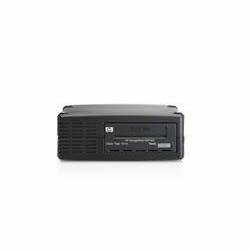 The DAT 320 is HP's first hardware-based data encryption capable DAT tape drive. The DAT 320 with USB 2.0 interface provides plug-and-play connectivity, enabling backup speeds up to 86GB/hr (assuming 2:1 data compression) and to be initiated from straight out-of-the-box in less than 60 seconds.